Use R&F Impasto/Modeling Wax beneath encaustic paints to build up textures and create three dimensional shapes. 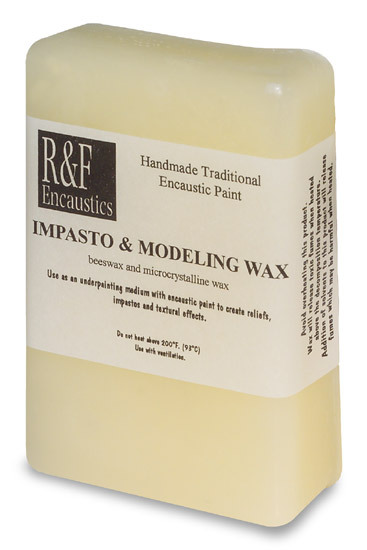 Impasto/Modeling Wax is a combination of microcrystalline wax and beeswax. The melting point of the Impasto/Modeling Wax is higher than that of encaustic paints, allowing the artist to paint and fuse the encaustic paint over a shape without blunting the sculptural details. Available in 333 ml (11.3 oz). Not for use on top layers, since it may discolor.